Have you guys seen Bobby Deen's (Paula Deen's Son) new cooking show? I love it! He takes his favorite Paula recipes and makes them lighter and healthier. He is so cute and has a such a fun personality. I have made two of his recipes so far and I really liked both of them! Hey, I am all for cutting out a few unnecessary ingredients in order to save a few calories. I know that one of Paula's most popular recipes is her Gooey Butter Cake and surprisingly I have never tried it, but Bobby had Paula on his show and he made her his lighter version. She seriously said - Oh Bobby - I think I like this better than the original! I can't tell you if it is better than the original, since I have never had it, but I did think this lighter version was really yummy! I will definitely be making this again and I can't wait to try a chocolate version! On the show, Bobby told us Paula's original recipe has 330.5 calories and 14.6 grams of fat per serving, but his "lighter" version only has 222 calories and 8.6 grams of fat per serving! Preheat oven to 350 degrees. Spray a 9''x9'' baking dish with nonstick cooking spray. Place the cake mix, buttermilk, oil and egg in a large bowl and using an electric mixer, blend together until smooth. Spread the mixture into the prepared baking dish. For the filling: beat the cream cheese until smooth. Beat in the sugar, yogurt, butter and vanilla. Spread over the cake mixture. Bake 40-45 minutes. DO NOT OVERBAKE. You want the center to be a little gooey. Yield: 16 servings. Jenn's Notes: I used a cherry chip cake mix instead of yellow and I ended up using regular cream cheese instead of light (but I think light would be just as yummy), since I had some that was expiring. I used an 8''x8'' baking dish that had pretty tall sides and the cake baked right up to the top. So, my picture will be a little thicker than yours would be if you use a 9''x9'' pan. I baked mine the full 45 minutes and that might have been 1 or 2 minutes too long, but the middle was still a little gooey. The cake part is almost a little dry, but when you eat it together with the creamy filling it is yummy! The filling is absolutely delicious and reminds me of cheesecake. I think I even liked this better the 2nd day (this is still good and it is the 4th day - the cake gets softer as days go bye)! I've only had her regular Pumpkin Gooey Butter Cake. 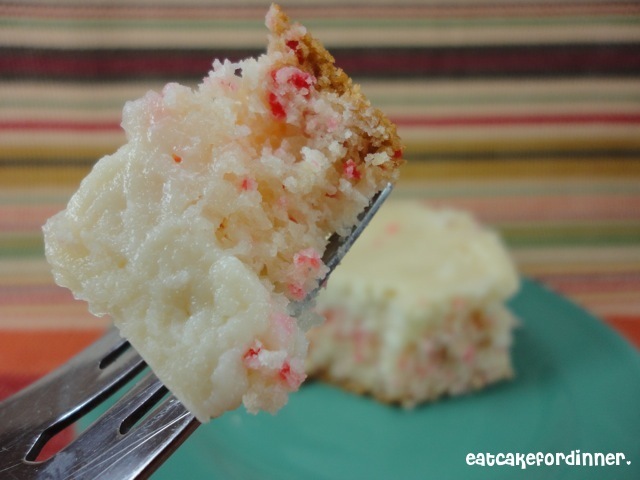 But I ADORE cherry chip cake, great idea! Ohhh I love the original, so I am sure I would love the lighter version, since the original can be a bit heavy! This sounds really good. I too have never tried the original but I have made ones similar myself. I know I have used fat free cream cheese and low fat buttermilk in my yellow cake for pineapple upside down cake, and it's always good and very moist. I will have to try this, and check out his show. Thanks for sharing. I am surfing blog land, so not sure if you have linked this up yet at Bacon Time, but if not, I would love for you to do so. Yum, this looks delectable! Thanks for linking up! I haven't tried the original either. I didn't know Bobby had his own show? But I like a lighter version since I'm not a big sweet eater, my downfall is snacks. So will be trying this out. Regular buttermilk is low in fat, isn't it? Looks really good and thank for sharing the recipe. So appreciate you sharing your creative inspiration at Sunday's Best. Yeah, his show is called "Not My Mama's Meals" I really like it. The brand of buttermilk I buy is low-fat, but I have never noticed if they all are? Yum! I'm all about cutting the calories!